Each year I try to remember a few friends with a "love" gift of cookies. 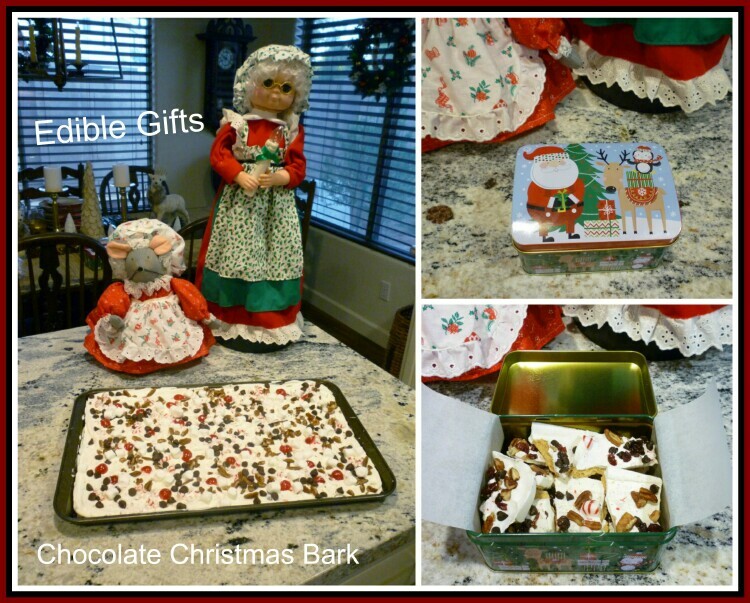 This year I thought I would switch it up and make a ton of Chocolate Christmas Bark candy. It is so easy, so inexpensive and it makes a ton of candy in minutes. The wonderful thing about this is you can make all kinds of flavors and decorate with all kinds of different things. Since I was making two kinds as gifts for friends and neighbors, I kept them both pretty simple. This one is made with pecans, chocolate chips, cherries and mini marshmallows. Here is all you need to make what ever you want. You can mix these up any way you like. I used regular and chocolate graham crackers, cherries, peppermints, chocolate chips, dried cranberry chips, chopped pecans, mint extract and vanilla chocolate candy wafers. (I found mine at Hobby Lobby - 2lb bag for $7.99 - be sure to use your 40% off coupon - that makes them only $4.79.) I had all these toppings in my pantry, so all it cost me was the price of the candy wafers. Create a double boiler by adding water to a pot and placing a glass bowl over it. You need a pretty good size bowl for all the candy wafers. See the 2 lbs really fills up a big bowl. Line a baking sheet with graham crackers. Crush up your mint candies if using. Stir the candy occasionally as it is melting. Fill some bowls with your topping so it is easy to add them to the candy. Hubby helped pour as I scraped the bowl. The candy needs to be spread evenly quickly to coat all the crackers. Now is the fun part. Just start sprinkling all your topping all over the candy. (Work rather fast so it doesn't set up on you. Then take the back of a spatula and gently press the toppings into the candy mix. All done. Now just place in the fridge to set up. This is the one I made with cranberries, chocolate chips, mint candy and pecans. I found some really cute Christmas Tins at the Dollar Tree. They are the perfect size for a "love" gift. They had several different designs too. I lined the inside with parchment paper. When the bark is all set, just break into small pieces and fill your container. You could also put these in cute boxes too. I am sure your friends, co-workers, neighbors or anyone would love this gift. One tray filled up 6 of these boxes. That brings the cost of each box to about $2 including toppings and the box. This is soooooo good, and who doesn't love chocolate? Great idea, Marty! The sweet treat looks delicious. This looks delicious, Marty! Love that you can change up the toppings. An easy gift for neighbors and friends. This looks delicious Marty and you look gorgeous on your picture! Thanks for sharing such a neat idea for a love gift. I have not had this and it is so simple. I am sure it taste wonderful. Your home looks beautiful for the holidays too! Marty, this is such a super cute idea for a 'love' gift!! I would love to be able to recreate the Williams Sonoma Peppermint Bark that my daughter and I are obsessed with every Christmas!! Looks yummy and easy too! Thanks Marty!